I have seen this meme floating around the internet for a while now. It made me stop and think about the definition of a crafter: a person whose occupation requires skill with the hands. 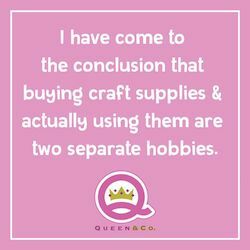 If this is true, then buying craft supplies is indeed, a separate hobby from using those supplies to create art. 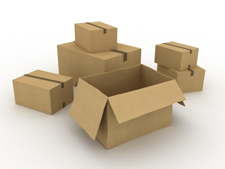 If you are uncluttering, you may want to take a look at your hobby supplies and equipment. Owning craft supplies does not make you a crafter; using the supplies does. Likewise, owning musical instruments does not make you a musician. You must regularly play the instruments to be considered a musician. You don’t need to be a virtuoso, you just need to enjoy playing regularly. There are reasons why you may wish to keep certain things but make sure they are legitimate. When we moved to England, we kept our ice skates. There were no rinks in our area but we knew we would skate once we returned to Canada. However, my husband decided he would do recreational skating only so he donated all of his hockey equipment. A friend of mine found that playing her clarinet while she was pregnant made her nauseous. She vowed that after the birth of her child she would pick up the instrument again. She started playing again when her youngest turned two years old and after a year or so, joined a small orchestra that accompanies a local theatre group. Consider giving yourself a deadline for uncluttering unused equipment and supplies. For example, if you have not played your musical instrument or used your ham radio in over one year, you might wish to sell it. Put a moratorium on purchasing new hobby supplies and whatever you have not used in six months could be donated to a community centre. Hobbies and pastimes are great but make sure you’re practicing the right one — using your equipment and supplies, not just buying and storing them. Our daughter used her crib for less than two years. It started to lose its usefulness when she began to climb out of it. We also decided to move her into a “big girl’s bed” when we moved into our new home. If we had gone with a convertible crib, we could have easily doubled the time she used her crib. Convertible cribs, for those who don’t know, are cribs that convert into smaller beds. This makes the transition to a regular bed a bit easier for some children, and definitely easier for parents. The crib pictured is the Davinci Emily Convertible Crib. The large rail on the back of the crib can eventually be used for a headboard for a full-size bed, as shown. The day bed conversion rail kit, full size headboard and footboard are included with this and most convertible cribs. There are many different makes and models of convertible cribs, so make sure you shop around. Looking for cribs on craigslist or garage sales can save you a lot of money but be sure that the crib meets today’s safety standards. My wife and I have decided to put our house on the market. Our current home is too large and we would like to downsize. To get our home into order we have decided to have a yard sale. You don’t realize how much stuff you accumulate until you take an inventory. It is a bit overwhelming. Browsing: Go through every room of your home and browse for things that you don’t use or don’t need. Sorting: After doing the first walk through of your home separate everything into logical categories; kitchen, bathroom, baby clothes, baby toys, back to school college items, and then box them up for easy transport. Trashing: You will inevitably come across some items that no one would ever buy. Don’t waste your time by including them in your sale, so get the trash bags ready. Consultation: Try and get some pointers from a yard sale veteran in your neighborhood. We have the expertise of my mother-in-law who has had many garage/yard sales under her belt. She also frequents the yard sale circuit and is familiar with what people want and how things are priced. Start an hour earlier than other yard/garage sales. Since most start at 8am, start yours at 7am. Put an ad in the classified section of your local paper, Facebook Marketplace, and other online classified ad services such as Craigslist, to run the day before the sale. Be sure to mention key items in your ads, such as collectibles, antiques, maternity, furniture, baby clothes, electronics, etc. Those are the most looked after items. Directly after the your sale, make arrangements with a friend or family member with a truck to pick up the unsold items to take directly to a donation center. We’re looking forward to this uncluttering opportunity and the extra money will come in handy too. G’day eh? 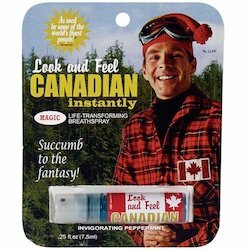 I sees this ‘ere product, Canadian Breath Spray, and I wonders if it’ll make anyone sound Canadian if they use it, eh? Lard tunderin’ if it did b’y we’d have youse all pronouncing Newfoundland (noo-fn-LAND) correctly. I’d bet you a Loonie or a Toonie that you’d be drinking double-doubles at Timmies while wearing toques. Of course, you could stay at the cottage and mix your mickey with pop while sitting on the chesterfield eating ketchup chips. We know the keeners will give’er by calling the last letter of the alphabet ZED. Any Americans using this product will put the letter U in words like favour, colour, and labour while the British will have to spell words like organize, patronize, and itemize with a Z not an S.
Nous avons deux langues officielles au Canada. C’est possible, en utilisant ce produit vous parlerez français. There is no need to put on your runners and queue up for this product. It doesn’t really work — SORRY! Summer is here and with it comes camping, camp fires, and of course, s’mores. Over the years, we’ve featured various s’more makers in our unitasker series including a barbeque s’mores maker, an old fashioned s’mores maker, a microwaveable s’mores maker, and even s’more s’more makers. This summer is no exception. 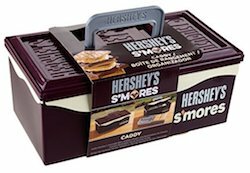 A big thank-you to reader Gabrielle who sent us a link to the Hershey’s S’mores Caddy. It is a plastic box designed to hold all the ingredients to make s’mores. IT IS AN EMPTY BOX! That’s right. For $10 USD, you get a plastic box. You have to buy the ingredients separately. And, it is designed to hold only a specific size of Hershey chocolate bar and a specific size of graham cracker. I guess if these are your favourite brands, that would be fine but if not, you’ve just wasted your money. However, if wasting money is your goal, you can spend $16 USD and get the SUMPRI Smores Caddy because it has a place to store extra candy and SUMPRI roasting sticks neither of which are included. 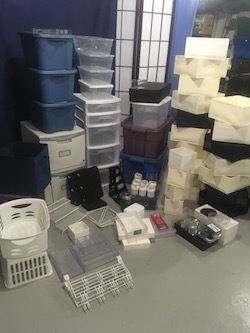 In our post on helping kids develop organizing skills, reader Vicki asked for suggestions to help a developmentally challenged person get organized and be able to maintain the level of organization. When helping someone get organized, adapt the system to them and the way they think and exist in the world, rather than having them use a system that they cannot relate to. 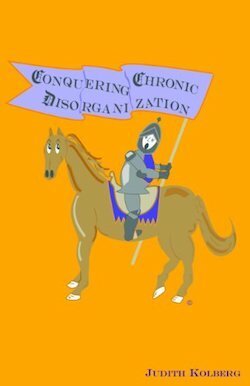 Another great book for people with ADD, ADHD, and everyone else is ADD-Friendly Ways to Organize Your Life: Strategies that Work from an Acclaimed Professional Organizer and a Renowned ADD Clinician. It is packed full of basic and straight-forward suggestions that work for any age group from toddlers to grand-parents. When I was doing hands-on client work, it was one of my “go-to” books for easy-to-implement ideas. 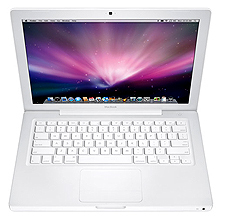 Some people manage just fine using electronics such as digital calendars and various apps to stay organized. Other people prefer paper-based calendars and planners. There is no right or wrong way. It is a personal preference so do not try and force a person to use something that does not resonate with them. One of my all-time favourite resources for uncluttering and organizing information, is Unclutterer readers. Everyone is unique. Different ideas and perspectives enrich our community. Thank you to those of you who comment on our posts and participate in our forum. To all other readers, please be sure to read the comments to find more great advice and if you have an idea, you are welcome to add it. When we lived in England, our home had picture rails mounted on every wall in the lounge (living room) and dining room and on at least one wall in each bedroom. At first, I thought it was odd. But, the walls were made of concrete covered with layers of plaster so when I tried to hang a picture by drilling a hole and sinking a plug, I almost broke the masonry bit, the plaster kept chipping off, and it was a big mess. I purchased some equipment to hang my pictures from the rail at my local hardware store and hung my artwork. It was the easiest thing ever! The following post (updated since it was originally published in 2007) talks about the ease and versatility of the picture rail system, something that I will install in our next home. My father is a wildlife photographer. As his daughter, I have free access to his always expanding portfolio. I do not, however, have an always expanding supply of wall space to display my collection of his work. To solve my conundrum and to keep my collection from getting out of control, I decided to turn the walls of the first floor of my house into an art gallery. 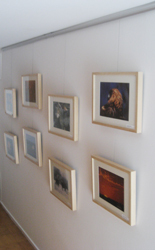 I started the project by installing an art gallery hanging system along the top of my walls. Cables slide into the tracks, and pictures hang from hooks that attach to the cables. I can hang multiple photographs on the wall at once, in any configuration, without having to hammer a single nail. I currently have enough of his photographs that I can change the artwork on the first floor of my house three times a year. It does take some time to switch out the frames–I only have one set of frames that I use–but on the whole it is a pretty quick process. When the photos are not hanging on the walls, I store them in glassine envelopes inside an archival storage box. Having a limited number of pictures out at a time and the others stored safely in a small storage container keeps my collection of my father’s artwork uncluttered. If you’re someone in a small space or who has a large artwork collection, you might want to consider installing an art gallery hanging system in your home. The system certainly worked for me.